There is no need to put up with any more neck and shoulder pain at your desk with this quick and effective step by step process. 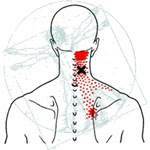 Neck and shoulder pain has become a common problem for a lot of people in the workplace. If you spend a lot of time working in an office, especially sitting at your desk in front of a computer, you will know all about this. Well … it’s now time to solve this nagging little issue as we have got just the solution. Download this one page chart containing a 4 minute sequence of 12 stretches and start feeling the physical benefits to assist you getting through a productive days work.